I wanted to finish up by posting a few last pictures of the project. This was what the trip was all about. One picture below shows Sandra going outside the center to try and bring a few girls who, for reasons we never understood, didn’t feel they could come and join us. 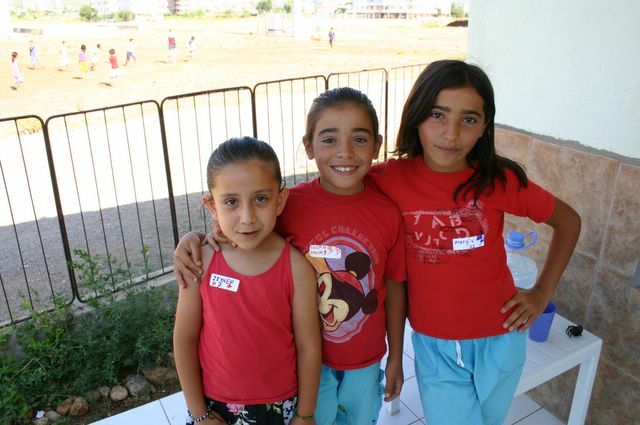 We make it our job to show them that they mattered to us and to bring them in. Unconditional love. Perhaps some day these kids will wonder why they were shown such kindness and they will think about the God who we worship. 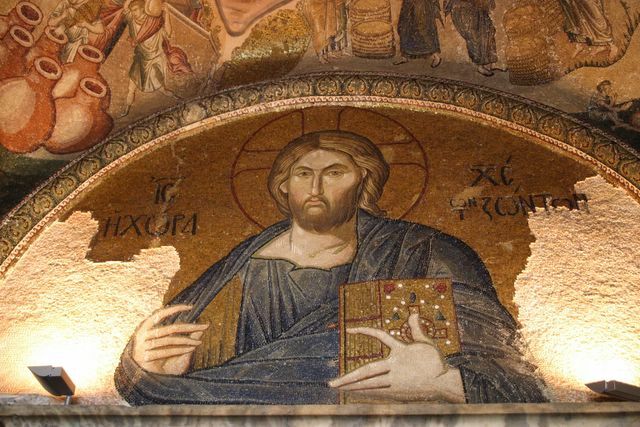 Verna King says that our job is not to convert anyone – that’s the Holy Spirit’s job. Our job is to witness. God is in charge of the rest. I can live with that and just be thankful that He might have used us as a small part of His great plan. A few of our kids. At the end of the day, the girls went back to the Grand Bazaar and I walked around and took a few more pictures. 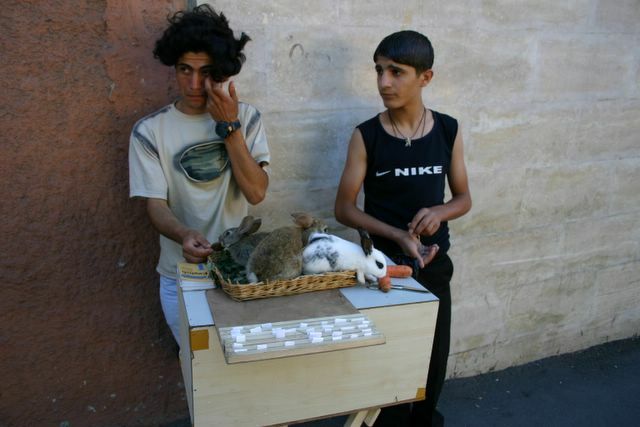 For one Turkish lira, I had one of these rabbits tell my fortune. They pick a piece of paper out of a board with a fortune on it. Mine was bad (or so the guy at the hotel desk said). If it had mentioned anything at all about a tough return trip, It would have made me a believer. On the Asian side we took a boat out into the Bosphorus to visit Maiden's Island. 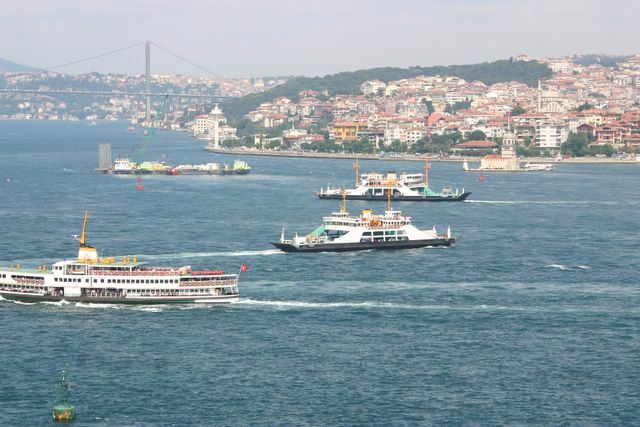 The Bosphorus is filled with ferryboats that cross back and forth, carrying people, cars, and goods. A little like Seattle, but the rides are only 70 cents. 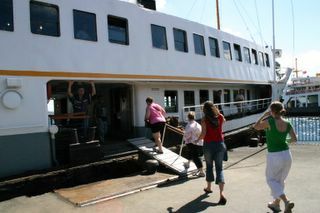 Next we boarded a ferry to cross over from Europe to Asia. Turks take tea very seriously. 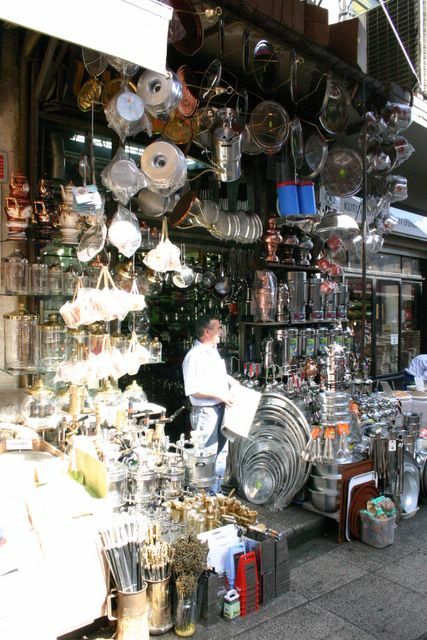 One section outside the bazaar had a number of shops that sold all things related to tea: pots, trays, cups, and all sorts of coal and electric tea pots we�ve never even dreamed of. 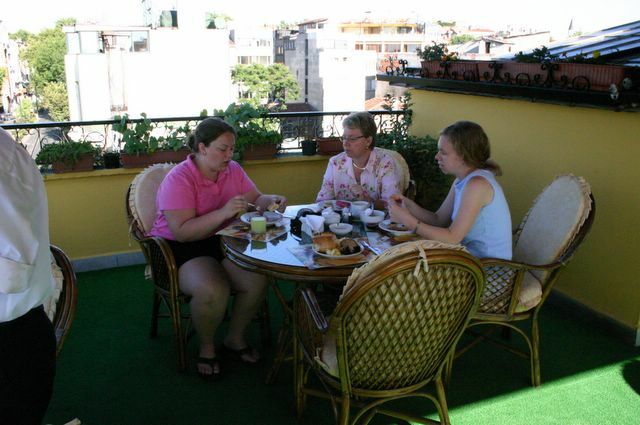 We bought a few tea items here from a very nice man (who spoke no English) and felt good we were bring back something real Turks would actually use. I found the shops outside the bazaar that cater to the locals more interesting than the tourist shops inside. 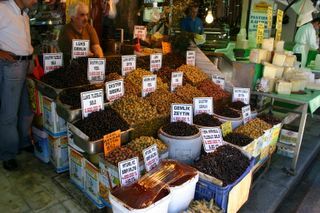 This is the Spice Bazaar and you can smell the spices as soon as you enter. It a mix of tourist stuff, spices, and food. It's been here since Roman days when ships from Egypt brought exotic spices to the nearby docks. An electric tram ran right in front of our hotel. 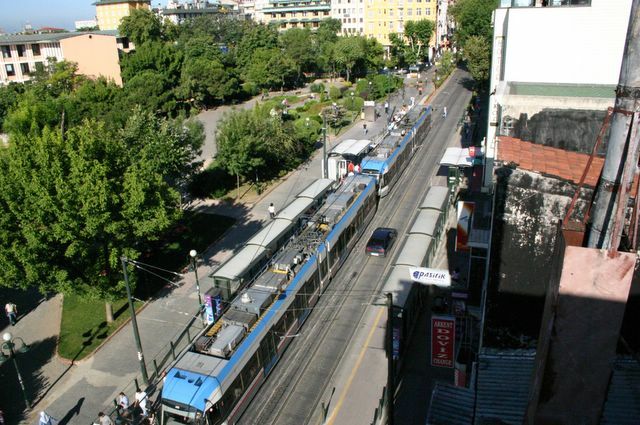 We took at a short distance, down the hill to to the area of the Galenta Bridge, the Egyptian (Spice) Bazaar, and the Emin�n� ferry docks. 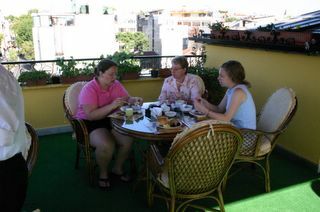 A little breakfast before our last day in Istanbul on our hotel's rooftop terrace. 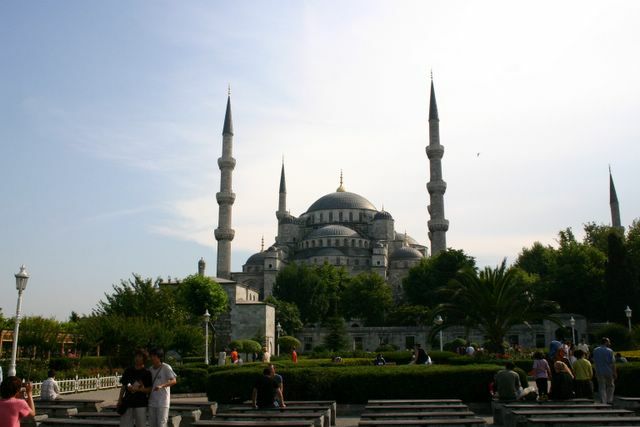 Last stop for the day was Suleyman�s Mosque, the largest in Istanbul. It so big, it impossible to get a picture of it when you�re near it. You get a sense of the scale by looking at the entrance and the size of the people. 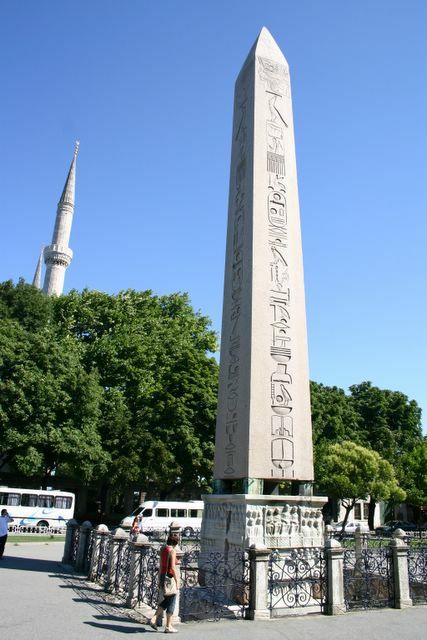 What do you do when you�re a Roman Emperor and you find an ancient Egyptian obelisk down in Egypt you like? You move it to your Hippodrome in Constantinople (the Roman name for Istanbul). They had to build a special ship to carry it. On the bottom of the obelisk is a marble base showing the emperor watching the games and rooting for his favorite team. 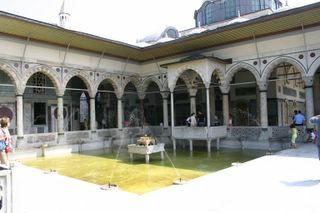 Topkapi Palace. 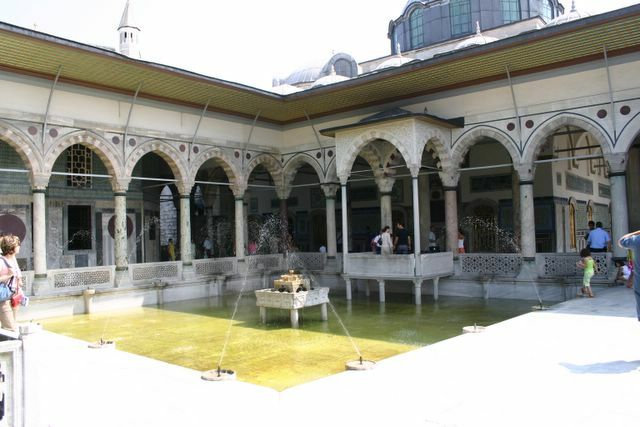 This was the seat of power of the Ottoman Sultan�s and it is an amazing and elaborate complex. It was also the site of the palace complex of the Byzantine empire. Lots of history took place here and it still holds stunning treasures. 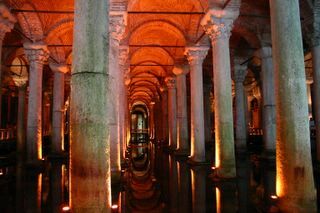 Next stop is the Basilica Cistern, almost right across the street from our hotel. 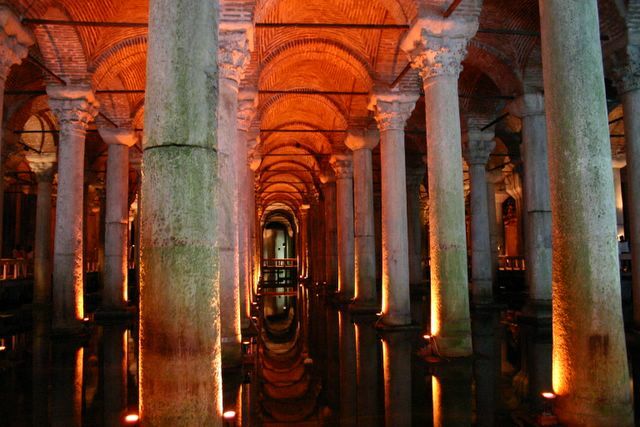 It was built in the 5th century to hold water to give the city a good water supply in case of siege. There are several in the city. This one was used in the James Bond movie �From Russia with Love�. 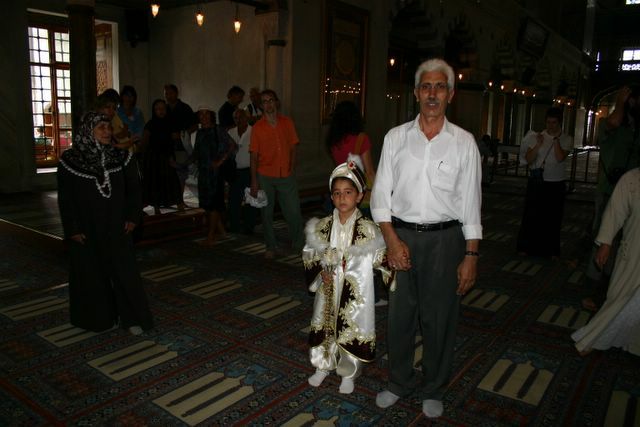 Inside the mosque, I got this shot of a boy dressed up for his Circumcision ritual. Boys who are about 10-12 get dressed up in prince�s clothes, parade around town, then go to their home where there is a party. The boys are given gifts when the procedure is over. Next stop is the Blue Mosque, named for the many blue ceramic tiles on the interior. 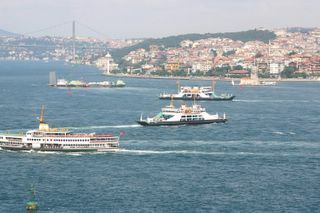 Yes, this is Istanbul. 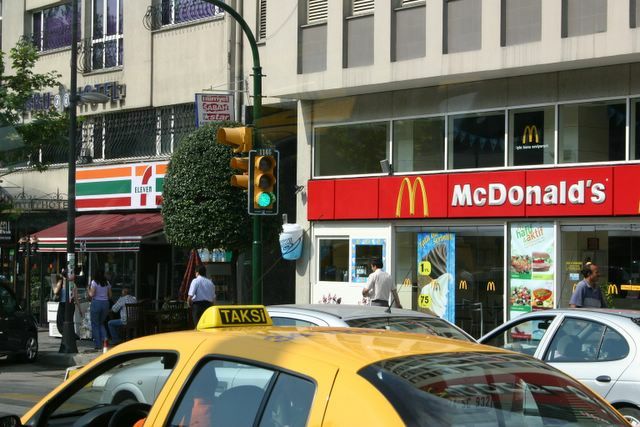 I never got to try a "McDoner" (doner is a Turkish meat, grilled on a vertical spit). 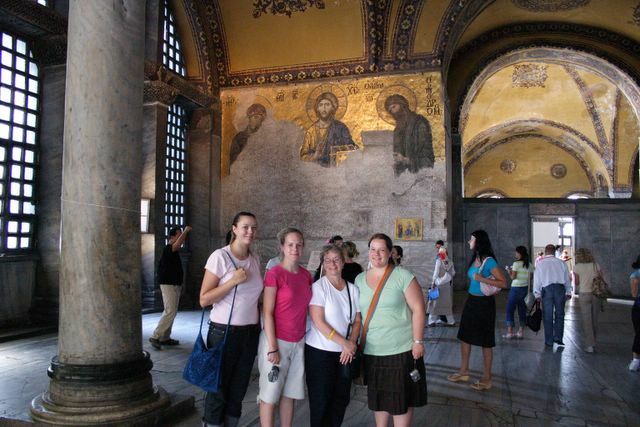 On the tour the next day, we visited a church with maginificant mosaics and frescos from the 11th century, the Chora church. This one looks like a painting, but it is a mosaic. This is how it looks on the outside. Here is the team in front of one of the most famous mosaics. This is one of my favorite pictures of Jesus. 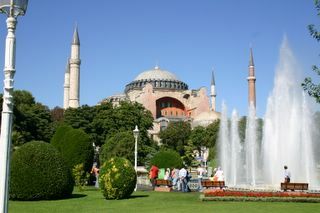 As soon as we got setteled in Istanbul, we headed to the Hagia Sophia, about 100m from our hotel. It was the largest church in the world until St. Peter's was built. It has stood since the 5th century and it is simply too vast to take a inside picture that does it any justice. Well, I’m back. I’ll post a few pictures of our last few days. I should mention that while all my days in Turkey were great, my trip home was a little tough. There are three possibilities. I may have caught a bit of a flu type bug. I may have ate something that gave me a touch of food poisioning. Or, I may just have eaten too much rich food on my last day (Yes, I did over do it a bit. Hey, it was my last chance to get good Turkish food for a long time). So, by the time we get to the airport at 4am on Wednesday morning, I’m feeling pretty lousy. Fever and stomach cramps. By the time I was on the plane, I was feeling even worse and at one point headed back to the bathrooms. While waiting for one to open up, I started feeling dizzy. The next thing I knew there were all sorts of people staring down at me and I was on the floor. At least I gave the flight attendants something to talk about. As it turns out, when I passed out I twisted my knee pretty badly. It stiffened up over the next 13 hours of the flights. Not my best trans-Atlantic trip. As I write this on Thursday, I’m feeling much better. I’ve been on a 7-UP diet for that last 48 hours and Rick Vaughan tells me he thinks the knee is only sprained. 4-6 weeks of gimping around. All in all, not as bad as I thought it might be. I’m on home rest for a few days, just to be sure I have nothing contagious. That means I’ll likely miss church Sunday. See you all next Sunday. Thanks for reading. One last post before I return. Sorry, no pictures right now. I forgot my flash card reader and was using Alisha’s, but she’s back in Antalya now, while we have gone to Istanbul. I’ll try to remember to post a few when I get home. By the way, if anyone is reading this, you can post comments on my posts. It would let me know someone is out there. We had two days to visit some of the historic sites. This place is over 2000 years old. 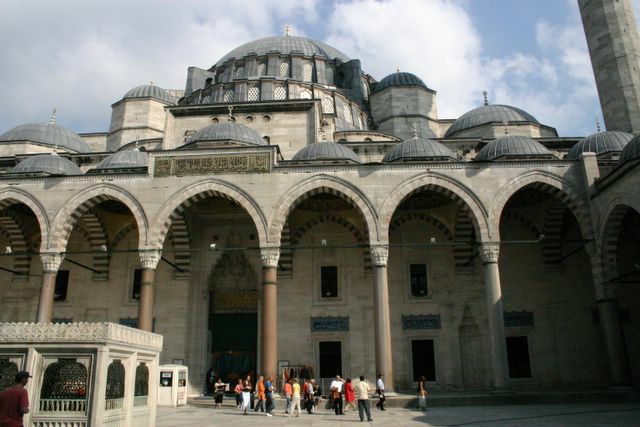 It was the center of the eastern Roman Empire, the Byzantine Empire, and the Turkish Ottoman Empire. There are amazing sites to see. History just oozes out of this place. We just scratched the surface. 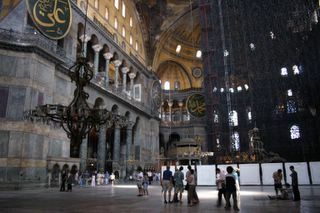 Yesterday, we visited the Hagia Sophia, Blue Mosque, Suleyman’s mosque, Topkapi Palace (the old Ottoman palace complex), the Sunken Palace Cistern (it was in the James Bond film “From Russia with love), Chora Church (amazing mosaics), and…the Grand Bazaar (4000 shops under one roof, all trying to get you to buy from them, aghhh). 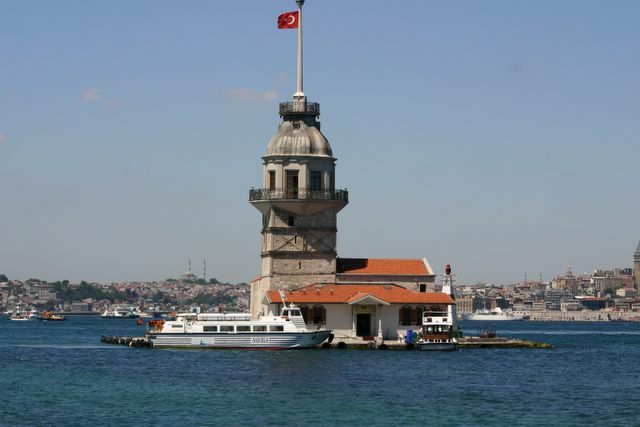 Today (Tuesday, I think) we visited the Spice Bazaar, took a ferry across the Bosporus to the Asian side, then went to Maiden’s Tower. 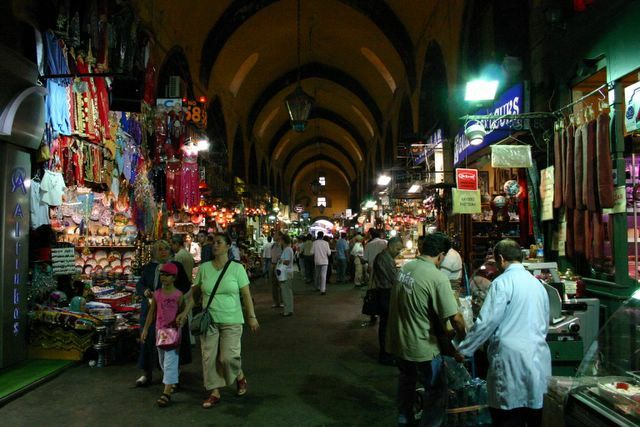 When we returned, a few of the ladies went back to the Grand Bazaar. I think they are now out of money. I skipped the Bazaar, but I did have my fortune told by a rabbit. Tomorrow we leave at 3:30am for our 6am flight back to Seattle. It’s been a good trip and we spent some time today talking about the kids at Kepez, wondering what they might look like in a year and taking about sending them Christmas cards. This is an amazing country, filled with wonderful people, but also needing a way to come to know God through His Son. It was great to be a small part of opening a door and to wonder how God might use us in the future. Some of you might begin thinking now about joining a service team in the coming years. Here are some pictures from our post project whirlwind Biblical site tour. These will probably be the last pictures I’ll post, since I’m now without a cord to transfer pictures from camera to my computer. Enjoy. I’ll see you all in a week (expect me to be jet lagged). Remember, if you're just now looking at this blog, scroll down and read from the botton up. Newest posts are at the top. 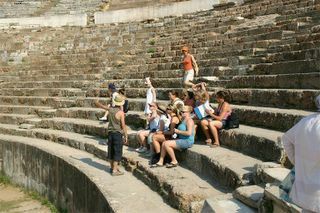 This is the theater in Ephesus. 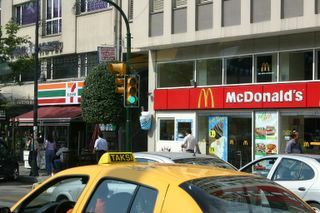 Read Acts 19:26ff to see what happend here. 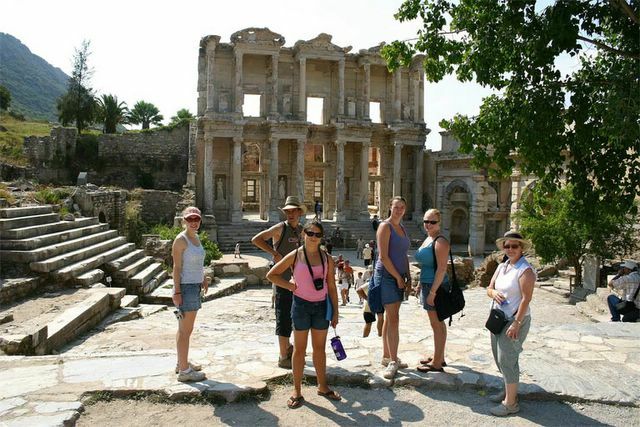 Here we are at one of the greatest Biblical sites outside Israel, Ephesus. Paul was here for two years. The Apostle John lived and died here (possibly Mary too). 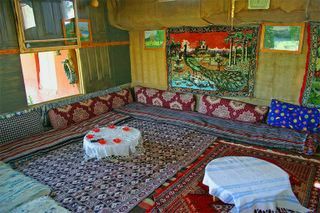 This is a little traditional rural tea salon we stopped at for a late morning tea. Carrie and a friend out on our play field. Halimae couldn't wait to put her shirt on.